Whilst trends do come and go (and in some cases come back again - high waist jeans anyone?!) we always carefully work on our designs to ensure they maintain a simplistic look whilst gently incorporating any new creative trends. This allows for a modern yet classic piece of jewellery that will withstand the test of time and be worn for years to come. Trending in the jewellery scene at the moment is textures. Be it beaten, brushed, polished or matte, using a combination of textures gives a unique look and can help showcase a stone. Pictured right: Lost Sea Opals "Through The Loop" crystal opal pendant featuring a combination of smooth polished and brushed 18k yellow gold. When it comes to making jewellery with a textured finish we use the same metal (gold, sterling silver) as we do with a polished finish and create the texture by hand. The use of textures in rings especially is on the rise. Rings are the piece of jewellery that cop wear and tear probably the worst! Being knocked and bumped into hard surfaces all day long. A textured finish on the band will conceal most minor day to day blemishes that occur. Pictured: Left, Lost Sea Opals 18k yellow gold black opal ring featuring a raw silk effect band. Centre, Lost Sea Opals "Moonscape" sterling silver boulder opal pendant feature a hand beaten disc. 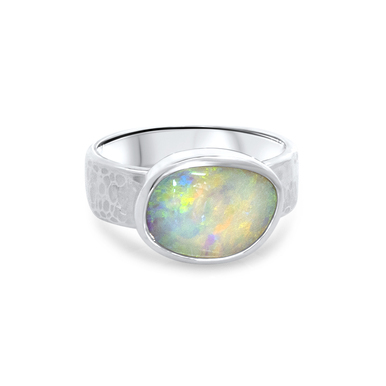 Right, Lost Sea Opals sterling silver light opal ring featuring a hand beaten band. Whether it's a hand beaten band on a ring, or our current personal favourite, the raw silk effect, we think this is one "trend" that is going to stand the test of time.